"Fred Hayes" redirects here. It is not to be confused with Alfred Hayes (disambiguation). 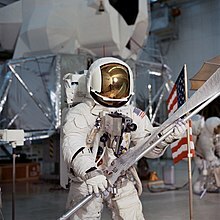 Fred Wallace Haise Jr. (/heɪz/ HAYZ; born November 14, 1933) is an American former NASA astronaut, fighter pilot with the U.S. Marine Corps and the U.S. Air Force and test pilot. He is one of only 24 people to have flown to the Moon, having flown as Lunar Module Pilot on Apollo 13. He was to have been the sixth person to land and walk on the Moon, but the Apollo 13 mission was aborted before lunar landing. He went on to fly Space Shuttle Approach and Landing Tests in 1977, and retired from NASA in 1979. Born on November 14, 1933, and raised in Biloxi, Mississippi, Haise attended Biloxi High School, from which he graduated in 1950, and Perkinston Junior College, with original aims of a career in journalism, receiving an Associate of Arts degree in 1952. He was a Boy Scout, earning the rank of Star Scout. Eligible for the draft and despite being apprehensive of flying, he joined the Naval Aviation Cadet (NAVCAD) training program. Haise underwent Naval Aviator training from 1952 to 1954 and served as a U.S. Marine Corps fighter pilot at MCAS Cherry Point, North Carolina, from March 1954 to September 1956. Haise has accumulated 9,300 hours flying time, including 6,200 hours in jets. After his military service, Haise returned to school and graduated with a Bachelor of Science degree with honors in Aeronautical Engineering from the University of Oklahoma in 1959, concurrently serving in the Oklahoma Air National Guard, as a fighter interceptor pilot with the 185th Fighter Interceptor Squadron. He then worked for the newly created NASA, first as a research pilot at the Lewis Research Center near Cleveland. His Air National Guard unit was called up during the Berlin Crisis of 1961 and he served ten months as a fighter pilot in the United States Air Force. He was a tactical fighter pilot and chief of the 164th Standardization-Evaluation Flight of the 164th Tactical Fighter Squadron at Mansfield Lahm Air National Guard Base, Ohio. Haise completed post-graduate courses at the Aerospace Research Pilot School at Edwards Air Force Base, California in 1964, and attended the six-week Harvard Business School's Advanced Management Program in 1972. He received an honorary Doctorate of Science from Western Michigan University in 1970. In 1966, Haise was one of 19 new astronauts selected for NASA Astronaut Group 5. He had already been working with NASA for several years as a civilian research pilot. He was the first astronaut among his class to be assigned to a mission, serving as backup Lunar Module Pilot for both Apollo 8 and Apollo 11. "It only seems interesting to the public if it's the first exploration of another planetary body, or if you're having a problem." Haise flew as the Lunar Module Pilot on the aborted Apollo 13 lunar mission in 1970. Due to the free return trajectory on this mission, Haise, Jim Lovell and Jack Swigert, the other two astronauts on Apollo 13, likely hold the record for the farthest distance from the Earth ever traveled by human beings. During this flight Haise developed a urinary tract infection and later kidney infections. These caused him to be in pain for most of the trip. Haise was slated to become the sixth human to walk on the Moon during Apollo 13 behind Lovell, who was to be fifth. 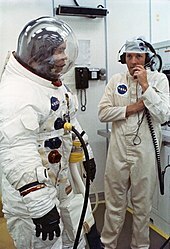 Alan Shepard and Edgar Mitchell eventually became the fifth and sixth, respectively, on Apollo 14, which completed Apollo 13's mission to the Fra Mauro formation. Haise remained in the astronaut rotation and served as the backup mission Commander for Apollo 16. Though there was no formal selection, Haise was prospectively slated to command Apollo 19 with William R. Pogue as Command Module Pilot and Gerald P. Carr as Lunar Module Pilot. However, the mission was canceled in late 1970 due to budget cuts. After completing his backup assignment on Apollo 16, Haise moved over to the Space Shuttle program. In 1977, he participated in the program's Approach and Landing Tests at Edwards Air Force Base. 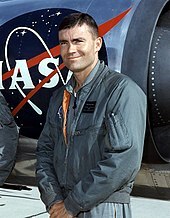 Along with C. Gordon Fullerton as Pilot, Haise as Commander piloted the Space Shuttle Enterprise in free flight to three successful landings after being released from the Shuttle Carrier Aircraft. These tests successfully verified the shuttle's flight characteristics, an important step toward the overall success of the program. Haise was originally slated to command the second Space Shuttle mission, which would have delivered a booster module that would have boosted the Skylab space station to a higher orbit, preserving it for future use. However, delays in the Shuttle program development as well as an unexpected increase in Skylab's orbital decay led to the mission being abandoned. Skylab was destroyed upon entering the Earth's atmosphere in July 1979, while the Space Shuttle did not launch until April 1981. In June 1979, Haise left NASA to become a test pilot and executive with Grumman Aerospace Corporation, where he remained until retiring in 1996. He has four grown children with his first wife Mary Griffin Grant, whom he married in 1954 and divorced in 1978: Mary M. (born January 25, 1956), Frederick T. (born May 13, 1958), Stephen W. (June 30, 1961), and Thomas J. (born July 6, 1970). He married his current wife, the former F. Patt Price, in 1979. Haise is a fellow of the American Astronautical Society and the Society of Experimental Test Pilots (SETP); member, Tau Beta Pi, Sigma Gamma Tau, and Phi Theta Kappa; and honorary member, National WWII Glider Pilots Association. Haise's other awards include the AIAA Haley Astronautics Award for 1971; the American Astronautical Society Flight Achievement Awards for 1970 and 1977; the City of New York Gold Medal in 1970; the City of Houston Medal for Valor in 1970; the Jeff Davis Award (1970); the Mississippi Distinguished Civilian Service Medal (1970); the American Defense Ribbon; the SETP's Ray E. Tenhoff Award for 1966; the A. B. Honts Trophy as the outstanding graduate of Class 64A from the Aerospace Research Pilot School in 1964; the JSC Special Achievement Award (1978); the Soaring Society of America's Certificate of Achievement Award (1978); the General Thomas D. White USAF Space Trophy for 1977; the SETP's Iven C. Kincheloe Award (1978); and the Air Force Association's David C. Schilling Award (1978). He was inducted into the International Space Hall of Fame in 1983 and the Aerospace Walk of Honor in 1995. He was also one of 24 Apollo astronauts inducted into the U.S. Astronaut Hall of Fame on October 4, 1997. Bill Paxton played the role of Haise in the 1995 film Apollo 13. Haise enjoyed the movie and has seen it multiple times. Adam Baldwin also played Haise in the 1998 HBO miniseries From the Earth to the Moon. ^ a b "Fred Haise to lead '77 space shuttle test". Eugene Register-Guard. UPI. Feb 25, 1976. p. 5A. ^ a b c d e f g h i j "Astronaut Bio: Fred Haise". NASA, Lyndon B. Johnson Space Center. January 1996. Retrieved May 8, 2013. ^ a b "There was time planes worried astronaut Haise". Sarasota Herald-Tribune. Associated Press. April 7, 1970. p. 12A. 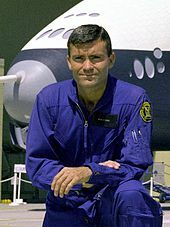 ^ "Fred W. Haise". Eugene Register-Guard. Associated Press. April 12, 1970. p. 5A. ^ Tom Jones[permanent dead link] "Disaster at a Distant Moon," American Heritage, Fall 2008. ^ "Astronaut Fred Haise: Apollo 13 Crewmember". Space.com. Retrieved 2016-02-22. ^ "Space flight milestone to be reached in July". Sarasota Herald-Tribune. (Washington Post / L.A. Times). April 11, 1977. p. 13A. ^ "Shuttle's maiden solo flight Friday". Beaver County Times. UPI. August 11, 1977. p. A2. ^ "Space Shuttle solo is soaring success". Milwaukee Sentinel. (Los Angeles Times). August 13, 1977. p. 3, part 1. ^ "Test bumpy, but shuttle lands safely". Free Lance-Star. Fredericksburg, Virginia. Associated Press. October 27, 1977. p. 15. ^ "Space shuttle landing rough". Lodi News-Sentinel. UPI. October 27, 1977. p. 22. ^ a b "People: Fred Haise". Lodi News-Sentinel. July 17, 1995. p. 7. ^ "NTSB Accident Report FTW74FRA11, Convair BT-13A, N2200S". Retrieved 28 March 2019. ^ "New York Times: Former Astronaut injured In Crash of Vintage Plane". Retrieved 28 March 2019. ^ Slayton, Donald; Cassutt, Michael (1994). Deke! U.S. Manned Space from Mercury to the Shuttle. New York, New York: Tom Doherty Associates, Inc. ISBN 0-312-85503-6. Wikimedia Commons has media related to Fred Haise.